Based on information provided by industry sources, Digitimes reports that Intel will begin phasing out Sandy Bridge processors this September. Intel's recent announcement of several brand-new, dual-core processors allow Ivy Bridge to finally thrive in spaces where Sandy Bridge has remained a long-term resident, namely Ultrabooks, laptops and lower-end PCs. With that in mind, this makes good sense. Ivy Bridge CPUs feature a 22nm design and come in three flavors: desktop (S), mobile (M) and ultra-low voltage (U) variants. The maximum thermal design power for Ivy Bridge CPUs is significantly lower than that of Sandy Bridge, ranging from a ULV low of 17W TDP to a very respectable 77W TDP for higher-end i5 and i7 desktop models. That's roughly a 20% improvement over the TDP numbers found on most Sandy Bridge processors. As a result, Ivy Bridge has proven ideal for portable and miniature applications such as the Intel NUC. 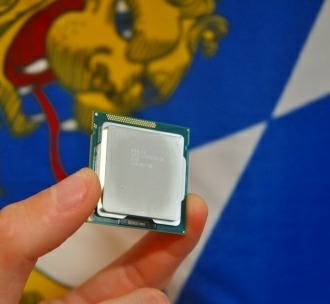 Intel says OEMs have already been receiving shipments of third-generation Ivy Bridge CPUs. Consumers should begin to see those systems later this month. The chip maker also hinted that it expects to ship 50 percent more Ivy Bridge CPUs in six months than it did within the same period of time last year with Sandy Bridge. However, as usual, price may prove to be a challenge. Ivy Bridge CPUs are considerably more expensive than their Sandy Bridge counterparts. According to Digitimes, the price disparity is roughly $67-100 per unit -- that's a lot of money, particularly for OEMs where razor-thin margins on mainstream products are the norm. If Intel is indeed planning to phase out the old and phase in the new starting this September, it is reasonable to assume that OEMs and enthusiasts should be seeing some substantial price cuts this summer.